Bank of America Merrill Lynch is key strategic partner and lead corporate supporter. The company’s partnership began in 2012, and has enabled Inspiring the Future to go from strength to strength. Currently more than 35,000 volunteers are signed up to give inspiring talks to students, which includes 1,000 employees from Bank of America Merrill Lynch. Bank of America Merrill Lynch is guided by a common purpose to help make financial lives better, through the power of every connection. They deliver on this through responsible growth with a focus on environmental, social and governance (ESG) leadership. ESG is embedded across their business and reflects how they help fuel the global economy, build trust and credibility, and represent a company that people want to work for, invest in and do business with. It’s demonstrated in the inclusive and supportive workplace they create for employees, the responsible products and services they offer clients, and the impact they make around the world in helping local economies thrive. An important part of this work is forming strong partnerships with not-for-profits and advocacy groups, such as community, consumer and environmental organisations, to bring together their collective networks and expertise to achieve greater impact. Learn more at about.bankofamerica.com, and connect on Twitter @BofAML. Employees from Bank of America Merrill Lynch’s offices, including regionally in Chester, Bromley and Camberley volunteer their time and skills with young people at Inspiring the Future events helping to impact 629,729 young people to date. Support to launch Inspiring the Future in Ireland, launch event hosted in the National Gallery in Dublin with support from the Tánaiste and Google. “We are extremely proud of our association with the Inspiring Women campaign which already provides such valuable counsel to young women across the UK. The programme’s international expansion to China is very exciting as it will give even more young women the opportunity to gain a better understanding of the vast array of career options available to them. 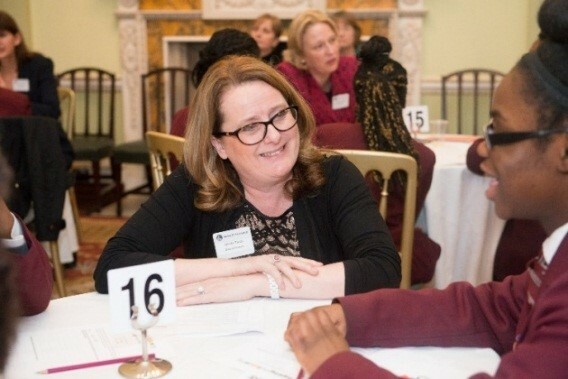 Jennifer Taylor networks with students at the Inspiring Women in Finance event.